Yesterday saw London hosting the glamorous Sammie awards – a ceremony in which the great and the good of the sandwich world gather to toast the UK’s best sandwich. The sandwich, along with the wheel and dynamite, is one of man’s greatest inventions. Initially created for the Earl of Sandwich in order for him to eat his roast beef dinner and not leave the gambling table, its popularity has not faltered since. Its appeal is largely for the same reasons today. This slice of genius allows us all to hold a meal in one hand and carry on working, playing or gambling. The broad appeal of the sandwich and, in particular it’s fillings, is a reflection of the Great British public. Essentially it’s not particularly healthy and although it aspires to the exotic it really is a fairly safe and unassuming creature of habit. By far and away the most popular sandwich fillings remain as chicken, followed by tuna and what’s more, we tend to stick to our ‘usual choices’. As you know, I am constantly watching out for the next trend in food and so here’s a lovely coincidence. About 3 or 4 years ago I was in ‘The Biscuit Factory’ in Cape Town. A once derelict former biscuit factory reincarnated into and super trendy artisan retail space complete with a pop-up food Emporium, where I was sniffing out the next best idea. One of my big favourites was called the curry bunny. A brioche bun with its innards scooped out and filled with a delicious curried meat in the Cape Malay style. Whilst we were at the market, we bumped into celebrity chef Phil Vickery who was on much the same errand. Whilst chatting to Phil about some of the things we had seen around the market, I told him absolutely not to miss the curry bunny and we carried on our merry way. Fast forward three or four years and earlier this year The Best Breakfast awards for 2015 went to a hand held sandwich of sorts. Judged by Karen Levy, who works for the serial company that organises the awards together with, yes you guessed it, Phil Vickery. The judges chose a breakfast which was described as a standout winner. 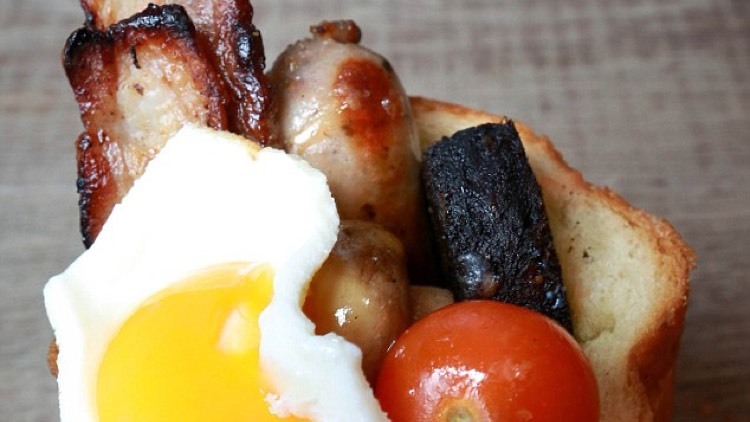 It was the creation of one of London’s newest cafe-restaurants called Bunnychow and the winning breakfast was the Full English Bunny.